The community card reveals begin with a Paladin card with Twinspell. Lightforged Blessing was revealed in a video with a catchy song by Japanese site Dekki. Every recent expansion has a card printed for Heal Paladin and Rise of Shadows is no exception. 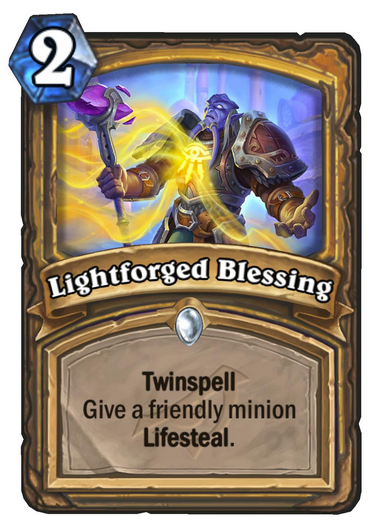 While it may not seem exciting at first glance, Lightforged Blessing can work really well with Wild Pyromancer and Immortal Prelate. Obviously this card isn't made to be used early, since Heal and Control Paladin don't really have early board presence, and one copy of it should be enough, since it has Twinspell. The other issue is that no matter how much support Heal Paladin keeps getting and even though its concept is well made, it never really took off as an archetype. It never took off as an archetype really, because, there is nothing to do in late game. So, all these heals can help an established win condition, but they don't make a deck. Assume paladin just heals themselves the entire game, then what? That is why most of these cards found a place in OTK Paladin builds. So, unless paladin gets some late game support (another Tirion Fordring-esque card maybe), healadin will not be a thing. About the card, it has serious synergy with Immortal Prelate. If there are any other buffs for Paladin, two copies of this guy can serve as a late game value, especially if one of those buffs can give him (her?) another keyword, preferrably taunt. Eh, seems weak tbh. Paladin already has ways to heal and draw cards, or heal and gain other good effects, this just heals. At the end of the day I don't think that's enough. In wild, this card is epic in quest paladin. This can actually create a new type of control quest paladin, as this card and the echo buff can be alone enough to complete the quest.